The hair on your face is just like the hair on your head. How it looks reflects on your appearance. This is where the best mustache wax comes in. Grooming your beard or mustache helps keep it in line and tidy, not to mention lets you eat and drink without the hairs getting in the way. More importantly, it lets you style your facial hair differently so you can try out different mustache styles to your liking. When it comes to grooming, the 2 most important things are your fingers and a good tub or tin of mustache wax. If you plan on doing some styling like handlebars or other styles then going with something that has a firm hold is ideal. If you want to just keep it in place, the softer more pliable ones will do the job. Some people like to have a mustache comb along, but it’s not necessary though it can help. The best thing about these grooming products is they’re quite inexpensive. Most running between $10 and $15 per tin so you can experiment with a few and see if you like how they hold as well as their scent. The Honest Amish’s Original Beard and Moustache Wax is an all natural product for the care of facial hair. This product contains only natural and organic materials including beeswax, essential oils, and fruit and nut butter. It is meant to be used to shape and control facial hair, not as a styling aid. Men with a wiry or unruly mustache or beard hair should not buy this product. Only a small amount of the wax needs to be applied each time. To use it, just apply rice kernel or pea-sized bits of the wax to your fingers first and then work your fingers throughout the area being groomed. The result will be hair that stays in place without evidence of a waxy residue. This allows your facial hair to look natural, while you are keeping it groomed. In some cases, the wax may need to be warmed to make it pliable enough for the application. Next in our mustache reviews is Professor Fuzzworthy’s Beard Care Gloss and Conditioner. The product is manufactured in Australia using only natural ingredients from Tasmania, an island province of that country. Bees from Tasmania produce the leatherwood honey and beeswax that are the main ingredients of this product. The other natural ingredients, including Jojoba oil, also come from Tasmania. This product is especially good for longer beards or mustaches if used to control and condition rather than shape and style the hair. The product does have a scent so you’ll want to test it out to see if you like it. Another good option is Firehouse’s Wacky Tacky Wax. This is one of three mustache waxes offered under the Firehouse Brand name. It is the darkest of the three though it does not appear as dark when applied as in the tin. Wacky Tacky is a thick, sticky wax which makes it a good choice for people with wiry, curly or unruly facial hair. One application usually is enough to hold facial hair in place throughout the day. The thickness of the product sometimes means extra time will need to be taken to warm it up. This can be done by working small amounts with the fingers, before application. It has a scent which should be taken into account by those with sensitive noses. 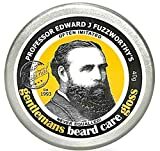 Captain Fawcett’s Mustache Wax is a product of the United Kingdom. It is one of three mustache waxes produced by the company. The recipe for these was allegedly an invention of Captain Fawcett, and the original recipe is followed to this day. Each batch is handmade from natural ingredients, and the variables inherent in using natural ingredients account for the differences between batches. The product is smooth and leaves little residue yet does a remarkable job of holding mustache hairs in place throughout the day. The lavender smell is not overpowering and helps reduce the strong waxy smell many find in other mustache or beard waxes. 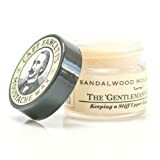 Men who want to present their mustaches in a consistent sculpted fashion, without the risk of an overpowering scent, may find Captain Fawcett’s Lavender Wax to be the best mustache wax choice available. Finally, our top mustache reviews get to the Stache Bomb Stache Wax. This is a product developed because of a felt need of its inventor, a mustachioed citizen of Maine. Jamin Badger found the mustache waxes available to him were not helping him prepare for the mustache contests he liked to enter. So he invented Stache Bomb Stache Wax. This product may be able to do a fair job of holding handlebar mustache ends in place but isn’t as adept when it comes to its ability to sculpt and control unruly, wiry or curly beards. Petroleum Jelly is one of its main ingredients so, not surprisingly, it can leave a bit of a greasy, oily residue in facial hair. So now we know which mustache wax options are best, the next still is to learn how to use mustache wax. Here’s a short video that demonstrates how waxing your mustache goes as well as grooming or styling it if you want to.